In the late 90's through 2002, I just took what the trails had to offer, mostly seeking South facing dry slopes or just going slow and taking my chances on trails covered in ice and snow, occasionally knocking the wind out of myself or spraining a wrist. In 2003, I discovered the wonders of screw shoes, drilling 3/8" sheet metal screws into an old worn out pair of trail runners. This worked remarkably well and was inexpensive, but the screws were high maintenance, either falling out occasionally or becoming dull rather quickly, requiring frequent attention and replacement. Even so, this opened up a whole new way to trail run in the winter. In 2008, I purchased my first pair of Kahtoola Microspikes and this was another game changer, allowing the flexibility of putting them on any shoe for just about any kind of slippery condition. I used them for running on the local peaks when there was snow/ice and for hiking/mountaineering in the high mountains. I did discover though that over time, when running on lots of rock and dry trail, they dull and lose their effectiveness on ice. Then Icebugs came along and I found these to be ideal when snow coverage is spotty, as is often the case here in the foothills above Boulder. Our mountain trails, at least the ones that I frequent the most, are often north facing and shaded, but we get warm enough temperatures during the day, the snow melts some, then combined with plenty of foot traffic for compaction and freezing temperatures at night, we get some impressive stretches of bulletproof ice. Unfortunately, by the time this bulletproof ice sets up, 1/3 to 1/2 of the trail is intermittent bare rocky ground. This is where Icebugs excel, as they are extremely durable, stay sharp over a long period of time no matter the abuse and the sharp studs get good grip on the ice (when the ice is particularly hard, they may slide, but it is more controlled). With an ever expanding array of traction now on the market, there is no real reason to run on a treadmill, bail on a run, run somewhere you would rather not, or most importantly, take unnecessary risks. Below are 4 of our favorites here at RoadTrailRun, options for any condition no matter your preferred terrain. Ideal use: Steep, rugged trails and off trail with packed snow and ice. I began using Kahtoola Microspikes back in October of 2008 and was an immediate fan. They instantly transformed the way I viewed the mountain trails/terrain in winter as a runner and mountaineer. They are very high quality, light, easy to use and provide amazing traction without being cumbersome. On countless occasions I have stopped people I have seen slipping and sliding on the trails and instructed them to go buy Microspikes after their hike. There have been several revisions along the way since 2008, each newer version changing just ever so slightly, but this latest version has added two additional points in the heel and have dropped an ounce per pair. The rubber is thinner on this newer version vs. the previous, accounting for the weight loss. The thicker rubber on the previous version seems more resilient and durable to me, but time will tell if that is truly the case or not. Kahtoola has also done away with the metal connecting rod at the toe of the shoe separating the front chains. In my opinion, this rod helps to distribute the pressure in the toe. I did not notice a significant difference, but have heard of people having issues with this. I think some of it depends on the type of shoe, thickness of the upper and thickness of the toe bumper. When sized correctly (if on the fence with sizing, size down a size), Microspikes stay on remarkably well and are quite secure when running at any speed on any angle frozen terrain. Running with confidence on hard ice, covered by a dusting of snow. Here I have the Microspikes on my Saucony Peregrine 7. With 12 x 3/8 inch heat treated stainless steel (sharp) points on each, Microspikes grab amazingly well on steep trails covered in packed snow and ice. These points are long enough to provide great traction, but are not so long that they become a liability. Here they are mounted up on my La Sportiva Mutants and seem almost made for this shoe. When using Microspikes, I tend to lean toward more substantial shoes (such as the pictured Mutant, Brooks Cascadia or my Salomon XA Alpine). I find that a more supportive, thicker soled shoe with a substantial upper and toe bumper aids a bit in comfort. If the upper material is too thin, the strap can be a bit constricting in the toe, which can be especially noticeable when it is cold and circulation is key. A thicker outsole/midsole also helps prevent any foot fatigue from feeling the chains underneath. This is rarely a problem, but I have noticed mild discomfort/foot fatigue when wearing Microspikes on too minimal of a shoe on harder surfaces. Microspikes also come with a handy tote, ideal for storage and not ripping up your running vest when stowed. Microspikes are an essential piece of gear for the majority of trail runners and hikers in snowy, mountainous regions. In the Front Range of Colorado, we get a fair amount of snow, that is constantly transforming from soft, fluffy powder, to a ribbon of packed snow, to icy snow, slushy snow and then eventually a layer of bulletproof ice. I find the Microspikes to be absolutely ideal when the snow is in the compacted phase, where the spikes grab the surface almost like velcro. I also use them often for Winter mountaineering in the high mountains, on packed trails where snowshoes are overkill and on the steep slopes above treeline, off trail with patchy snow, or even steep loose softer terrain where the spikes with bite in and add security and confidence. I have found longevity to be outstanding in previous versions, easily getting several seasons of hard use out of them. The points will wear down over time if you used them on mixed terrain (rock, pavement), but if you have a bench grinder, you can extend the life of them with a quick sharpen. I have found that there is enough metal on the points where I can sharpen them twice before there is no longer enough metal to restore a point, but this is over the course of years. If you use them on snow and avoid rock, you should be able to extend the life of them significantly. I expect the lifespan of this newest version to be comparable to previous iterations and I have heard very good things about Kahtoola's customer service and 2 year warranty. Microspikes are worth every penny and the fact that they often sell out by mid winter is a testament to their popularity. Kahtoola Nanospikes are similar to the Microspikes in design and purpose, but instead of 12 x 3/8 inch spikes, have 10 x tungsten carbide studs, similar to what you would find on a car tire. These studs are remarkably durable and by staying sharp and having a precise point, effectively bite into hard ice. The Nanospikes are slightly less flexible and take a bit more finesse to put on your shoe than the Microspikes, but after a bit of practice, becomes easier and easier. Putting them on a shoe with a lower profile tread helps as well. The Nanospikes have a very secure fit and a shoe with a substantial upper is highly preferred. The 10 carbide studs are secured to traction plates, 6 on the forefoot plate, 4 on the heel plate. While not a big deal on flat, consistent surfaces, I found the plates to feel a bit rigid and awkward on uneven terrain. I think the Nanospikes would perform a bit better if the plates were slightly more flexible and compliant. I also feel they could use a few more studs in the center of the forefoot, as that expanse of hard plastic can feel a bit slippery underfoot on uneven terrain. The traction plates have ridges on the inside of the plate to help create a no slip interface between the plate and the outsole of the shoe. Nanospikes are not effective in snow, but worked well on this iced over trail with just a dusting of powder. One minor issue I had with the Nanospikes was the configuration of support in the toe. If using on a somewhat minimal shoe with a thin upper, they dig into the toes and can be quite uncomfortable, if not painful. Nanospikes also come with a tote sack, but I found it difficult to put them back in, even when attempted in the warm comfort of my house, much less outside with cold fingers. Since the spikes are so minimal, I just stuff them in my pack or running vest without worry. Consolidated, well packed snow, icy trails and especially on quickly changing mixed conditions where one would not want to be bothered putting on Microspikes, taking them off, or risk dulling supplemental traction on rock and bare ground. Also great when trails and roads get coated with freezing rain. The beauty of the La Sportiva Hobnails is that you can install them in a variety of different shoes and not be constrained by a specific model of shoe that has built in studs. However, the shoe that you choose should have large enough lugs and the compound must be sturdy enough to withstand the forces put upon the studs when running in mixed terrain. It just so happens that many shoes in the La Sportiva lineup are ideally suited for this. Here I have installed them on perhaps the best winter running shoe on the market, the La Sportiva Crossover GTX. The hobnails are easy to install with the tool, but care must be taken to center them perfectly, as there is very little, to any leeway. You can see below that I transplanted the center hobnail one lug back, as I botched it once, tried again with no luck and then that lug no longer seemed strong enough. All of the other 17 hobnails went in easily on the first try though. The La Sportiva hobnails are the deepest studs that I have seen and they are very effective in getting grip on hard ice, even on high angle terrain (15-20 degree trails covered in sheet ice is no problem). The hobnails are described as "high end" metal studs, but I am not sure if they are carbide or not (as used on studded snow tires). They seem very durable regardless. I really like having studs when I know I'll be encountering a little bit of everything, as is so often the case here in the foothills above Boulder. A typical run will start off on pavement or dry trail, then intermittent hard ice, rock, more dry trail, more ice, then snow, then more rock, then back again. I don't worry about the studs becoming dull and they are minimally intrusive on dry ground (just a bit of scratching). My only real reservation on the hobnails is the price. At $54 for only 18 hobnails, that seems like a lot to me. Although they work great, having only 9 hobnails per shoe seems minimal enough that I have to strategically think about each footfall and be sure that I am landing quite centered. It works out most of the time, but occasionally I have a momentary lapse in attention, where I forget and I then spin out a bit. I would ideally like to have double that amount and would especially like a few hobnails for toe off on steep terrain. Very much like the hobnails, Icebugs work very well on consolidated, well packed snow, icy trails and especially on quickly changing mixed conditions where one would not want to be bothered putting on Microspikes, taking them off, or risk dulling supplemental traction on rock and bare ground. Also great when trails and roads get coated with freezing rain. With the lower profile studs, I think the IceBugs have a bit of an edge over hobnails if one is using them for icy roads, when intermittent dry pavement may be encountered. I have been running in IceBugs for 5 or 6 years and they have become one of my most reliable, go to winter shoes and when offered to review the newer IceBug Anima5 Bugrip, I was more than eager to put the latest pair to the test. The Anima5 weighs in at 11 5/8 ounces for my US men's size 10, which is quite a reasonable weight for a water resistant, well protected, studded winter shoe. It feels even lighter than that both in the hand and on the foot. 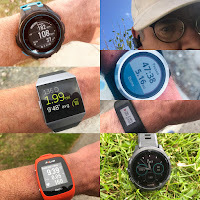 I'll soon give a more detailed review of the Anima5, but for the purpose of this comparison, will focus on traction performance. The Anima5 has has 19, strategically placed, non removable or replaceable carbide studs atop deep and aggressive lugs. The rubber compound is cold specific and on it's own gives very good traction. I really appreciate that the studs on the Anima are so plentiful, as they provide great coverage no matter how you step on slick surfaces and the two studs at the front of the shoe provide excellent purchase at toe off. The heel also has great coverage with 6 studs, plus one in the center of the shoe under the midfoot to cover those awkward missteps, or straddling a log. The studs on the Icebugs are not quite as pronounced as the La Sportiva hobnails, but what they lack in depth, they more than make up for in quantity. The shorter studs are also a little less obtrusive when running on bare ground, rock or pavement. Having put untold miles on previous pairs of Icebugs, several different models, I can attest that they are extremely durable and I have easily worn out the shoe before I wear down the studs and over that time, they don't really dull (nor do they fall out). This is typical ice on the trails in Boulder right now, often 15-20+% gradient. The Icebugs handle them with no problem. This ice is wet, but pretty solid after a week and a half of freeze/thaw. One other great benefit of IceBugs is that when it is warm, they shed snow quite well, where often on days where the snow is tacky, snow can ball up under the foot when using supplemental traction. Yaktrax is one of the earlier pioneers in the traction game with models for walking and running (like the Yaktrax Pro) that feature a coil over thin rubber bands criss crossing underneath the outsole, providing moderate traction on moderate to mellow terrain. I have used some of these earlier versions (though still available) and found them to be OK for casual use, jogging on snowy streets/sidewalks, walking the dog, etc... and they are really popular with mail carriers. When used on steeper, more mountainous terrain however, the Walk and Pro versions flounder and are especially delicate. Any use on varied terrain and your days are numbered. Enter the Yaktrax Summit, a huge step up for Yaktrax, as the Summit offers top notch traction and durability for steep, icy, technical all mountain terrain and is in direct competition with the Kahtoola Microspikes. The Summit is unique in that the 12 x 3/8" carbon steel points are positioned upon flexible plates in the heel and forefoot (4 in the heel and 8 in the forefoot) and secure with an adjustable Boa cable system. The plates on which the points are attached offer greater ease in positioning, stability and double for anti balling when the snow gets wet and compacted. The Yaktrax Summit performs extremely well on steep packed snow and ice when running or hiking, are stable, secure, comfortable and versatile. They are very easy to put on and take off and though I have not used them long enough to speak to their durability and longevity, they are very high quality and well constructed, so I anticipate years of use. The anti balling plates work in colder conditions, but when the temperatures warm and the snow gets tacky, snow does ball up under the plates. When conditions like this occur, I'll usually just remove them in favor of just a heavily lugged outsole anyways, so I find it to not really be an issue. So, which is the right choice for you? For hilly or mountainous, snowy or mostly snowy surfaces, Kahtoola Microspikes or Yaktrax Summits are the way to go. For hilly or mountainous, snowy surfaces that turn to ice and mixed with dry ground like we have in Boulder, I really think it is worth it to have Microspikes AND Icebugs or La Sportiva Hobnails to choose from as conditions warrant. If you live in flatter areas, the 3/8" points on Microspikes may be a bit much (though could be helpful for efficiency if running on snowmobile trails). In most case though, Icebugs, Hobnails, or Kahtoola Nanospikes would suffice. Nanospikes are also especially convenient for flatter, icy road runs because you can put them on your favorite road shoes and take them off if needed, adding to their versatility. The products in this article were provided at no charge. The opinions herein are entirely the author's. Jeff is a former pro cyclist who now runs and climbs the mountains of Colorado. He has been top 5 Masters, top 25 overall, at the Pike's Peak Marathon several times, finishing 3d Masters this year. Jeff loves vertical accumulating more than 500,000 vertical feet per year, has climbed all the 14's and 200 of the 13's and has held FKT on several. He often runs and climbs at night. 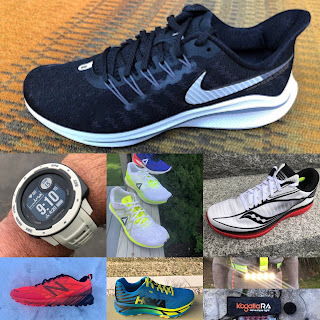 Passionate about the sport but also the gear he has reviewed hundred of shoes for various magazines and sites and participated in product testing for many brands. Formerly a bike mechanic he now works in Satellite Imagery. He has twin 6 year old daughters who keep him ever busier yet. Thank-you for the comprehensive breakdown of so many options! In Depth Altra Running Escalante Review:Fire!